At the onset of my life as a painter, I was more eager to make portraits of my friends and relatives than to use professional models from the academies. To be more accurate, my gift for portraiture functioned fully only to characterize human beings for whom I cared. My mother, who had styled herself as my chief art critic, thought that the quality of my work was entirely proportionate to the intensity of my feelings for each subject and that it should not have been so. She was right and that vexed me. The attachment I felt for my relatives and intimate friends allowed me to select from amongst their distinct physical features, the ones that best reflected their character and, therefore, I could aim at a likeness that was more than skin deep. Familiarity with the model helps the formation of these insights because the senses are impregnated with a thousand superimposed images that cohere to produce the right one. The idealization is more or less marked if the work is undertaken entirely from memory or to a great degree the result of direct observation. 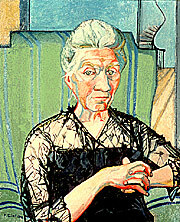 In Genevieve Thoughtful (1942), while the features are accurate, the truth of this portrait refers to an archetype. I wished to endow my friend with the qualities of a queen of cards because I thought that there was something fateful about her. Conversely, in My Grandmother (1943), I wanted to express my relationship to someone made of flesh and blood. I also wanted to show old age through the spider web of her black lace blouse and the deep furrows of her face. 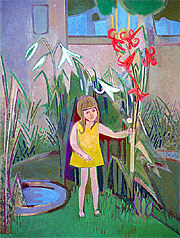 In 1950, I made several paintings on board of my children. They all pertain to my white period with graphite pencil lines incised onto a fresh layer of flake white and casein. The spontaneity of the postures and moments, so touching in young children, inspired the primarily graphic style of this series. 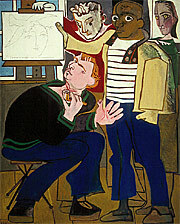 In the tradition of the homage, the picture entitled The Painters (1952), shows Pablo Picasso standing surrounded by Pierre Gastaud, myself, and Edouard Pignon sitting. Three generations of artists are thus gathered in front of one of his drawings of the series The Face of Peace (1951) illustrated with the one line poem by Paul Eluard, Man concerned with peace is crowned with hope. As in the homage to Cézanne by Maurice Denis, the oeuvre of the painter honored displays a painting within the painting and a compact group of supporting friends gathered around it. In my own composition, I am present in three different ways: once as author of the painting, once as the young disciple half-hidden behind the master, and a third time as his muse in his interpretation of my face crowned with a dove in flight. Thus, this work of mine is replete with meaningful psychological layers, the least of which carries not only a proof of love, but also a dose of irony toward these emblematic or figurative metaphors. The cycle ends in 1954 in Woman in Black with the return of the leitmotif of my friend Genevieve as my muse. Though I had not seen her in person since 1946, I liked to use her archetype in my works as my alter ego. Her presence at that time of anxiety and change clearly indicated my will to find resources within a universe entirely my own, and not within the confines of the world as shared with Pablo Picasso during the ten years of a passionate yet difficult relationship. 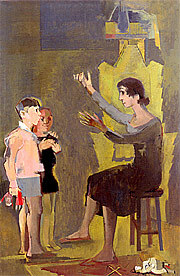 My mothers injunction that any model should be equally good to paint still kept running through my head  as well as the wish to abandon some stylistic habits adopted as expressive shortcuts during the preceding period  and moved me to have a young dancer and professional model sit for me. I became more interested in the purely pictorial aspect of my canvases without weakening structures but integrating them in a less obvious manner. This research did not prevent me from painting my children. While they were subjects of my affection, my artists eye now perceived them from a greater distance and paid more attention to the third dimension. My technique also evolved, leaving behind the heavy mahogany boards in favor of thick textured linen canvases. I began to use large pig-bristle brushes that produced strokes broad enough to define a plane and acute enough to draw lines when used on edge. In the Children in Winter (1955), Claude is staring at his sister Paloma, who busies herself with a page of writing, eyelids lowered as if unaware of being under scrutiny. On the upper left side of the picture, a vase holds nothing but dried flowers and autumn leaves in front of a cold gray background. The whole scene is pervaded with melancholy or even sadness. I do not think my children were as happy in Paris as they had been in the south of France when we were all together with their father. In Intimacy, (1956) which lends this theme its title, a mother (myself in this case) tells a story to both her children who stand huddled together. There is an interplay of attentive eyes watching one another, and also the gesture of the mothers hands defining the space of the tale. To begin with, the mother held a puppet in her hands, but I soon felt that it belittled the empty space and made the whole scene too anecdotal. It is better for the string puppet to lie forgotten on the floor in the lower right corner while the young boy is oblivious to the bereaved one he holds in his right hand. Thus the painting acquires lyricism and a poetic appeal, the narrative details no longer getting more attention than necessary so as not to burden the whole composition. In a study made to the completion of Intimacy, the three figures are set at equal distances in a round dance, but unity of purpose is not achieved and the overall feeling remains unclear. Equally on the subject of family life, until the end of 1959 there are a number of pictures of Aurelia, my younger daughter, and of Aurelia with Claude. One or both of them are shown framed in a landscape or rather as part of it like flowers or foliage. From 1960 onward, the intimacy of family life almost completely ceased to be used as a source of inspiration. The themes of importance to me became broader, more abstract, and more mythical. Children growing up were no longer as cute, and if their presence still nourished me aesthetically, it was most visible in my graphic work. It was also soon the case for my intimates, with the exception of Genevieve who remained my muse against all odds and periodically appeared in my work. Jonas Salk was another exception. I made four pastels and a gouache portrait of him one afternoon in 1974. We had met in 1969 and married the following year. Sometimes I incorporated a spiral staircase, as in the portrait of my grandmother in 1943, this time using it as a symbol of Jonas fervent hope of ever transcending himself, which was one of his most remarkable qualities. It was with Genevieve, a student of Maillol, that Gilot shared her first exhibition in 1943 at Madeleine Decre on the Rue Boissy d'Anglas in Paris. From the time of their first meeting at school when Gilot was twelve years of age, Gilot made hundreds of sketches and numerous oils of Genevieve almost Even today, she remains the most influential muse in Gilot's oeuvre. This splendid portrait is an expression of the deep devotion and love Gilot felt for her maternal grandmother, Anne Baud Renoult (1868-1951), who played an important role in the artists life. Although very early in Gilots development, this canvas already reveals something of her characteristic approach to form and content. The portrait is both realistic and symbolic. The simplifications and the color distortions rising from the artists manipulation of complementary colors in the face and background (red and green, blue and orange) heighten the vivid intentness of the image without obviously departing from natural appearances. The staircase at the upper right of the painting leads to the studio Gilot maintained on the top floor of her grandmothers home in the Parisian suburb of Neuilly. For Gilot, the staircase symbolized both her own future as an artist and, through its active upward movement, the indomitable optimism of her elderly grandmothers spirit. 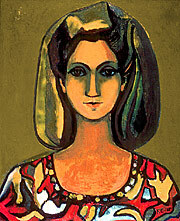 This portrait of Gilots youngest daughter, Aurelia, was painted during the Vegetation period of the late 1950s. Though stylized and modern in its depiction, the scene is accurate in every detail: the garden wall of her family home in Neuilly, the flowering lilies, the small pool. Interested in exploring issues of scale, Gilot structured this intentionally vertical portrait of Aurelia to accentuate the diminished perspective of a small child. The orange lilies tower over Aurelia, playing oranges against complementary blues. Various tones of green define the lushness of the garden vegetation and the hint of greater space and light beyond the high wall is reflected in the small pool of water. Gilots children and their activities were often the subjects of her canvases and works on paper during the 1950s.